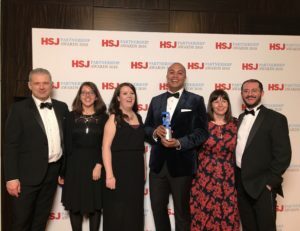 Yorkshire & Humber Academic Health Science Network and its partner Doc Abode are celebrating after winning the Workforce Innovation Award at the HSJ Partnership Awards in London. Our other partners Tookie and Healthcare Communications were also celebrating – Tookie was Highly Commended in the Medical Device or Hardware Innovation category and Healthcare Communications were proud to be finalists. Doc Abode is a platform that enables requests for out of hours home visits to be responded to by clinicians based on their availability, proximity and expertise. It was developed by Dr Taz Aldawoud. We’ve supported Dr Aldawoud and the development of Doc Abode for several years, initially through the our Proof of Concept programme in 2016. This was followed by pathway modelling, trials and a successful application to SBRI Healthcare’s GP of the Future call. Tookie is a medical device company that developed the Tookie Vest for use in paediatric oncology. We supported Tookie with seed funding to enable it to undertake further development work, commission technical drawings and build its website. We’ve since supported Tookie through the designs of further versions of the Tookie Vest for renal dialysis patients and respiratory patients. Our Programme Manager, Sophie Bates, said: ‘It’s fantastic to see that Doc Abode has been recognised for its contribution to healthcare innovation, winning the Workforce Innovation Award. I was also delighted to see Tookie be Highly Commended in the category of Medical Device or Hardware Innovation Award. We’ve worked with both companies for several years, supporting product development and commercialisation. It’s great to see both innovations recognised for their benefit to the healthcare system.